After the closure of Bartertown (RIP), the massive space next to Gita Pita sat empty until now. If you walk into Gita Pita today, you might notice the space is considerably larger. 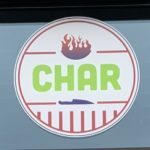 The owners of Gita Pita started a new venture, Char. 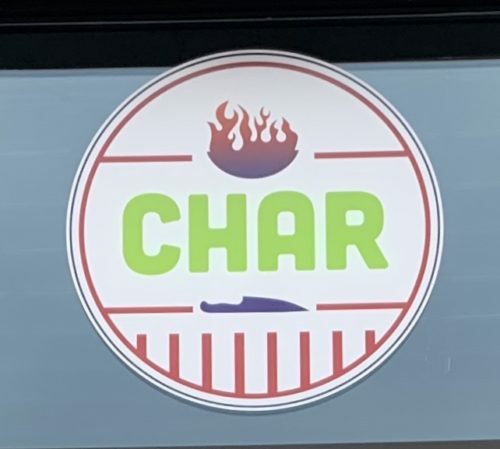 Char doesn’t exactly make it clear what sort of restaurant it is. An Asian noodle soup shop that also serves tacos? The other way around? We suppose it doesn’t really matter. The best way we can describe the food would probably be Asian-Mexican fusion? The fast-casual restaurant includes three styles of food to choose from. Tacos, a broth bowls, or a salads. The ingredients are basically the same across the three with some variation. For tacos, you get a choice of corn or flour tortilla. The (only) vegan protein is black beans. From there it’s a personal taste of additions, such as two types of kimchee (mild or hot), a cabbage slaw – your pick of veggie options for toppings (edamame, beets, red peppers, sesame seeds, green onion, cilantro, mushrooms, tomatoes, carrots, cucumbers, and red onions), a teriyaki glaze and you’re good to go. The broth bowl features a housemade vegetable broth and a choice of udon or rice noodles. Again black beans for your (only) protein option then pile on the toppings. The staff recommended a side of the sweet teriyaki glaze to add to the bowl to your liking. It’s pretty sweet so if that’s not your thing it’s also good without. You can also turn up the heat with spicy chili paste. A green bowl AKA everywhere else, a salad, starts with your choice of greens. Romaine, spinach, kale, or arugula or a mix if you prefer. Then choose your protein (you guessed it, black beans!) and pile on your choice of toppings. They recommend you order these with one of the two types of kimchee, green onions, cilantro, and sesame seeds. For dressings, three are vegan, all vinaigrettes. We tried all three, Mediterranean, Italian, and Asian and all are pretty solid. It’s another good option for lunch downtown or a quick evening meal. No frills, but who needs that? The staff is always super friendly. One of the only downsides is the beans-only option. It would be awesome to have another option for protein. When you’re in, ask them to offer tofu. Let’s see if we can make it happen! And with Gita Pita just a dining room away, it’s also convenient to grab food from both places if someone wants falafel instead. Char has no online presence, website or even a Facebook page – quite a feat these days. You can, however, order food online using Yelp (where you’ll also find a copy of the menu).